The order of a quiet medieval kingdom continues, the motions and energy synchronous with nature, the death and decay in balance with the life and energy, side-by-side. Castles rise, already ancient, and stand as a beacons power for centuries, until becoming ruinous haunted tombs, stone corpses on the horizon. In the heart of this realm lies a single ruler, cloistered in the top of a forgotten tower, the beating heart of majesty. Through the mystical vision of this god the world and its inhabitants come to life, subjects to the will of this power, whatever that will might be. 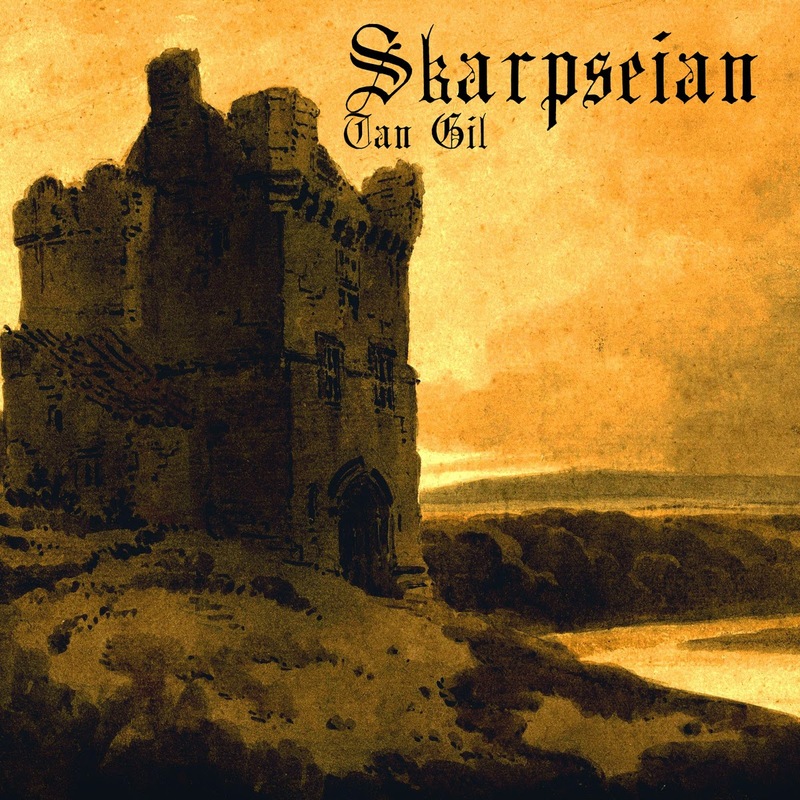 Skarpseian is one of the best dungeon synth artists, and not just of recent times. He seems to pick up right where Mortiis left off, not simply recreating the wheel, but expanding upon the pure vision. The themes and general tone here are similar to the previous album, Skygge Slottet, however Tan Gil proves that there was more to explore in this territory. The best comparison to Skarpseian would be Mortiis' first three albums, and in fact the progression of Tan Gil seems to almost follow a similar course, with the beginning being a detached blurry daydream of a desolate dark age scene, hidden in fog. This path changes a bit with Krysset Fjellene, which is an entrancing ambient, meandering track, a hard thing to do well. It feels like a breath of smoke gently drifting past the trees and off the cliff into the ocean. Then the transition from this track into the next one, Tengel, is a very striking force. The abrupt, violent shift has that perfect feeling of decadent power, a black tyrannical uprising. Many of the synth voices here will be familiar: horns, strings, woodwinds, and of course the timpani heartbeat. However these tones often have some sort of characteristic that distinguishes them, especially in the second half of the album. There are also a few distinctive synth tones, not directly relating to any real-world instrument, that stand out against the backdrop of grounded medieval imagination, for example the spacey tone that appears in the latter half of Tengel and the surreal warbling tone around the middle of Til Fjellet Grav, very unique atmospheres. What does the atmosphere of this album specifically refer to? It's hard to say. I'm sure the song titles have some relevance, but as to the actual feelings that the music evokes, it's a bit more vague. Of course diseased castles are prominent, foggy medieval landscapes, forgotten myths and battles, and other classic medieval fantasy themes, however there is also something else. That something else is what makes dungeon synth worth listening to. It's that atmosphere of mystery, that unformed image that seems familiar but still forgotten, as if it were somehow an obvious memory, yet can only be reached in the unconsciousness of dreams, completely inaccessible to the waking mind. Is this album digital only? Very good stuff. Yes, only digital right now, as far as I'm aware. Both Skarpseian albums were released as tapes not so long ago. "French underground label Wulfrune Worxxx have released Skarp's albums on tape. Both tapes are limited to 33 copies. Black'n'white printing, hand numbered instances, true underground \m/ ! If you want to make an order, or to release your music on Wulfrune Worxxx, feel free to contact the label via sending email to kommandoskogen@hotmail.com"
I got the first album which was quite enjoyable so I think I need to check this one out as well. Love the cover too, unusual shades. Hmph, not very keen on the tape releases by Wulfrune, seems pretty kvlt crap with 33 copies limitation plus I hate cassettes, they were once a necessity but not anymore with improved technology. I think I rather throw a few euros at Bandcamp.